We're starting a new chapter book called The Last Gold Diggers. I though Ian would really like this book since it was about finding gold but I knew Alec would like the story too since it takes place in Australia. We read a chapter or two (it's hard to tell as it's not really set up as chapters; it's a series of letters written from a grandfather to his grandson and it's hilarious!). We also read Edward the Emu (the prequel to yesterday's story) and a book simply called Australia. To finish up our geography lesson for the day, the older two boys did an art project for Australia. We made the Sydney Opera House! The boys started by painting a sky and waterline on some watercolor paper. They drew a light pencil line and then used green and blue watercolors to make a sky and the ocean. Once they were dry we used paper plates to cut out the shapes of the opera house and glued them in place using regular school glue (this was the hardest step for all of us!). 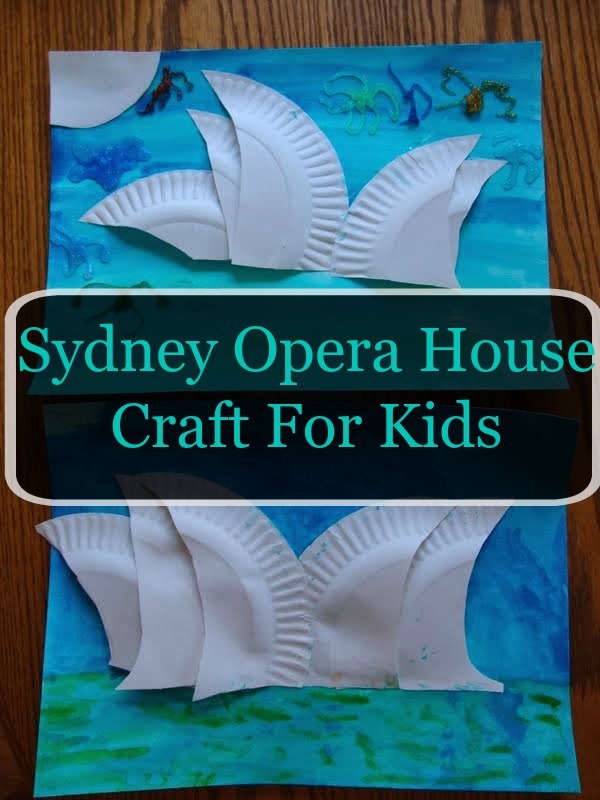 We used cheap paper plates and cut out crescent shapes-- looking at a picture of the Sydney Opera house while doing so. Ian decided that he was done once he had all that in place but Alec wanted to add some fireworks to his picture and so he took out the glitter glue/paint pens and drew some fireworks.